I reply that is the book by Mohan kumar sir is best and, I am proud to suggest that. Sir has invested a lot of time and effort to publish such a nice book. No wonder why the book got Atmospheric Science Librarian's Award...!!! "Hat's off" to you sir. "Prof.K. Mohan Kumar is an icon admired by students and staff alike" ...... that is the feeling our batch got while we were in MSc. 1St Sem. Sir was on leave when we joined and he returned back by the time we were in 2nd year. We were also told by our seniors that he used to sponsor the Onam sadhya in Dept. ! Unfortunately, we didn't have Prof.K.M.K's classes officially in our 3rd or 4th Sem. No sooner did we start interaction with sir, we understood that he is a very good academician, efficient manager, a strong motivator, a lover of art and overall a loving heart and a very down to earth human being. He was mostly very busy with lots of research scholars working under his guidance. I remeber an incident. During Dept. Onam program when we were in final year, all of a sudden that particular day was declared as hartal. All were upset. It was his motivation and Dr.Venu Nair's support that we all could overcome it. We took train from Kalamasserry early morning itself and reached Ernakulam south. The program was a huge success and of course we had a tasty Sadhya. I was told that similar things had taken place earlier also...!! There were many cultural programs including group events and games where all participated alike. We learnt something practical from the organising which I hadn't experienced before..
A kind of "disaster management", taking risks and fulfilling plans even though hurdles comes all of a sudden. As a team we tackle and we win. Similarly, with the motivation, encouragement and support from Prof. Ram Mohan, Prof.K.M.K. and Prof.C.K.Rajan we organised a cultural night "ATMOTSAV" in the Marine Campus for the first time. There have been quite a few instances I had the privilege to seek Prof.K.M.K's suggestion and advise. It has really helped. Later, during my research in SPL, Prof.K.M.K used to come to SPL for the annual review called Scientific Advisory Committee and being an expert, he used to very actively give suggestions and future directions. I had observed that Sir didn't like to compromise on the quality of research and he had frankly told people if he finds them going in wrong direction. 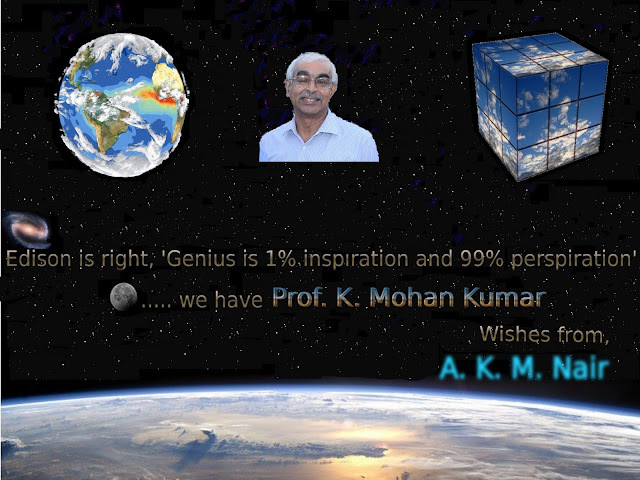 Mohan kumar sir has produced the maximum number of Ph.D's (20+). All his research students are all well placed in good institutes. They all have gained subject knowledge and scientific stuff from him and all of them are excelling in their respective fields. Soon after I joined SPL, there were some Scientist recruitments and Prof.K.M.K's PhD student Dr.Sijikumar was one of the selected candidates who cleared the tough competition. Meanwhile, I had already had interactions with Dr.Shambhu Namboothiri of Met Facility, VSSC (who was one among his early students'). Mohan Kumar sir's role in Ram Mohan sir's farewell function, seminar and Alumni meet in a boat is a memory to cherish. As we all know, Mohan Kumar sir materialised his dream project a Stratosphere--Troposphere Radar for CUSAT and has set up an Advanced Centre for Atmospheric Radar Research. It is one of the golden feathers in his cap. It is an ambitious project which will demand his full time concentration. Now, once he retires (just technically), he would become more busy and his knowledge and experience would be more devoted for understanding the science of our atmosphere. I take this opportunity to wish him a happy, healthy and peaceful life ahead with lot more scientific contribution. I would say “Edison is right, Genius is 1% inspiration and 99% perspiration” ..... yes, we have Professor Mohan Kumar in CUSAT. "An encounter and a near miss....." - a life story! It was Tuesday night around 11 PM. House owner came upstairs ...... he was panic-stricken.....!! I was over phone with my friend Raghuraman (London). ... now let be go and find the snake.. !!! .... and try snake charming!!!" These are what the happenings were soon after........!!. We didn't want to hurt it... just wanted to drive it away...!!! (Oh! as loud as some human had sounded it ....). probably angrily asking "who has come to disturb me.....?" ......it advanced nearer to me..!! ........this reptile wanted to play 'kabadi-kabadi' with me !! !, probably. .....oh! my God!!! (it was a near miss)..!! God's grace!! both our lives were saved !!! I didn't feel like going to hospital.....!!! just apply ointment , take medicines, have rest and keep hand in a sling bag like pouch which has to be held around the neck...!'. ....it would have become a big big incident !! OMG! I could not control my laughter ....!!!! Recalling back the incident, it send shivers down the spine...! 'an encounter which had a hairline miss'. My close friend Raghurama (as I call him often), is flying above seas, going far off to London to take up an assignment for the 'comet catching' mission of the European Space Agency. He would be working with the Principal Investigator in the famous Imperial College, London. Dr.Susarla Raghuram has already completed 6 orbits around the Sun after joining SPL with Dr.Anil Bhradwaj for research on Comets and have proved to be a world class young scientist. This is a graphics specially dedicated to him. Wishing him an active period ahead. Have a great time ahead Raghurama. Background image shows the April image of the Comet 67P-CG (red-circled) about which he is going to explore. 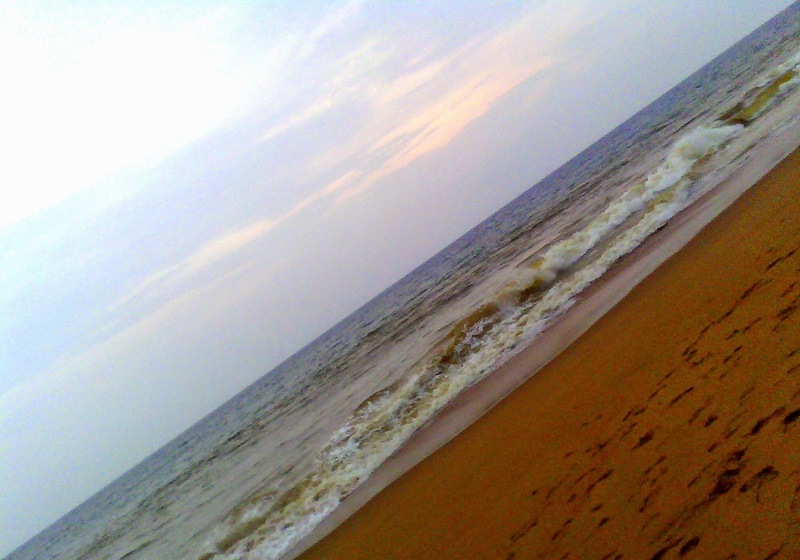 Ocean has the massive power of attraction. ...... and one would realize how tiny are we in the Earth. Have you heard of Cirrus cloud descending .........? Is it a frequent phenomenon .....? Does it have seasonal dependence ....? Where does it occur ......? Why do cirrus descend .....? What is it's impact .......? We have discovered the phenomenon using 3 years of lidar observations over Thiruvananthapuram, near southern tip of India that Cirrus clouds frequently DESCEND.....! After analysing the data together with other observations and models, we have come up answers to the above questions. The observations and results are now accepted by the scientific community and it finds a place in the Journal of Geophysical Research - JGR (Atmosphere). Nair, A. K. M., K. Rajeev, M. K. Mishra, B. V. Thampi, and K. Parameswaran (2012), Multiyear lidar observations of the descending nature of tropical cirrus clouds, J. Geophys. Res., 117, D18201, doi:10.1029/2011JD017406. .........sad that our neighbour passed away due to a massive stroke. Was it his compound wall demolishing sounds & vibrations the culprit? 'Noise Pollution kills. Says study' in TOI, Thiriuvananthapuram Edn. Came to know that he had collapsed while helping the masons demolish the wall ...... and was taken to hospital....... It was told that it was a case of heart attack/stroke. While paying homage to him saw the grief of the family in the air. Let the almighty give courage and strength to his sorrowing family. 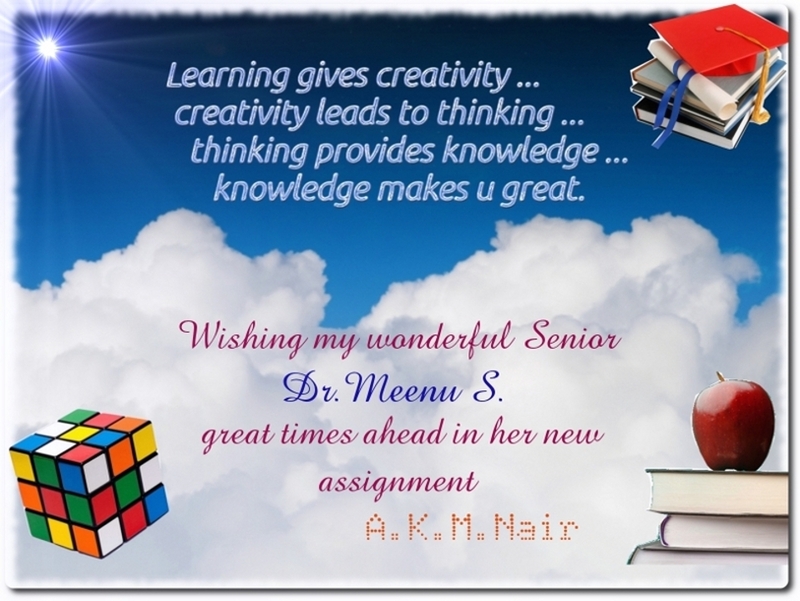 Today, my senior Dr.Meenu S has relieved her duties here in SPL and is getting ready to enter the noblest profession as a teacher to kindle the light of knowledge to many pupils. As a Gem of SPL, she has evolved into a sought after person in the area of Cloud Remote Sensing using Satellites. Author of many important papers. An expert with simplicity and hard working nature often made her popular. Click on COMMENTS below to read comments and make an entry. Onam Celebrations @ SPL 2010. Dr.Mannil Mohan, a Gem of SPL.